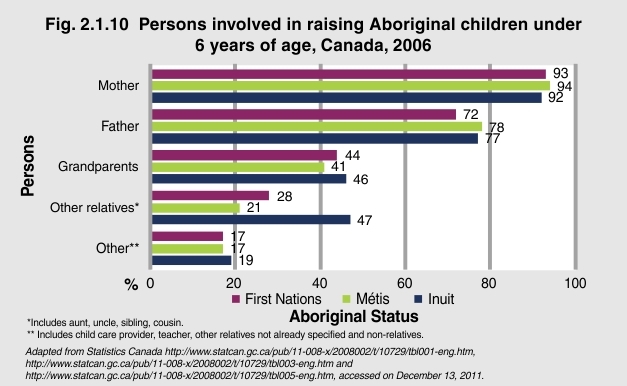 The 2006 Aboriginal Children’s Survey examined the prevalence of parent, grandparent, relative and non-relative involvement in raising an Aboriginal child under 6 years of age. The vast majority of mothers—First Nations (93%), Métis (94%) and Inuit (92%)—were involved in raising their children, as were many First Nations (72%), Métis (78%) and Inuit (77%) fathers. The survey also found that 44% of First Nations children under age 6 years were raised in part by their grandparents, as were 41% of Métis children and 46% of Inuit children. Other relatives, which includes siblings and extended family, were involved to a lesser degree among First Nations (28%) and Metis (21%) families, but played a more prominent role in raising young children in Inuit families (47%). Community-based, non-relative caregivers played a role in childrearing for 17% of First Nations and Metis children, and for 19% of Inuit children under the age of 6 years.